Name Variation Wilhelmina R. A. Goetsch was also known as Minnie. Married Name 24 November 1882 As of 24 November 1882,her married name was Hammermeister. Wilhelmina R. A. Goetsch was born on 14 January 1862 at Prussia. She was the daughter of Carl Goetsch and Frederika (?). Wilhelmina R. A. Goetsch married William F. Hammermeister on 24 November 1882. Wilhelmina R. A. Goetsch died on 27 June 1951 at Sauk, Wisconsin, at age 89. [S247] U.S. Federal Census 1870 U.S. Federal Census, by Ancestry.com, Year: 1870; Census Place: Rubicon, Dodge, Wisconsin; Roll M593_1711; Page: 469B; Image: 287; Family History Library Film: 553210. [S246] U.S. Federal Census 1880 U.S. Federal Census, by Ancestry.com, Year: 1880; Census Place: Washington, Sauk, Wisconsin; Roll 1446; Family History Film: 1255446; Page: 263D; Enumeration District: 264; . Name Variation Reuben F. Meyer was also known as Rubin. 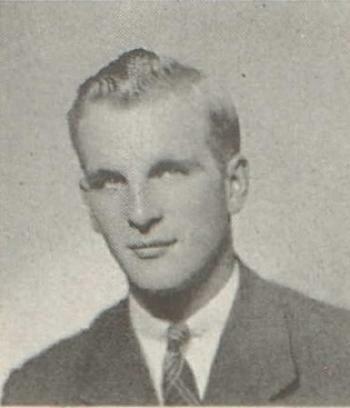 Reuben F. Meyer was born on 27 October 1925 at Wisconsin. He was the son of Paul Henry Meyer and Lydia Mathilde Dorothea Harms. Reuben F. Meyer married Audrey C. Wheeler, daughter of Ira Joseph Wheeler and Grace Ursula Dorow, on 4 June 1946. Reuben F. Meyer died on 13 September 2013 at age 87 Reuben F. Meyer, age 87, of Reedsburg, died on Friday, September 13, 2013 at Heritage Manor in Elroy. He was born on October 27, 1925 at Loganville, the son of Paul and Lydia (Harms) Meyer Sr. On June 4, 1946, he married the former Audrey C. Wheeler. Reuben farmed south of Loganville moving to Reedsburg in the summer of 1972. He then drove truck for Wisconsin Dairies Leasing in Hillpoint. He also managed Reedsburg Concrete and lastly operated R & J Liquor in Reedsburg until his retirement. Reuben enjoyed hunting, fishing, cooking and being in the out of doors. Survivors include his two sons: Mark (Sandy) Meyer, of Reedsburg and Gary (Nila) Meyer, of Buffalo City; five grandchildren: Stephanie (Mike) Bonham, Melissa (Andrew) Mowery, Matthew Meyer, Sean Meyer and Nicole Meyer; five great grandchildren: Ethan, Clare, Tyler, Audrey and Henry; his sister: Louise (Richard) Kaun, of Loganville; his sister-in-law: Dolores Meyer, of Reedsburg; his brother-in-law: Jim Brown, of Baraboo; his special friend: Judy Gugger; nieces and nephews; other relatives and friends. He was preceded in death by his wife, Audrey, on May 18, 1975; his granddaughter: Krista Meyer; two brothers: Donald and Paul and one sister: Kathy Brown. A private family service will be held on Tuesday, September 17, 2013 at the Hoof Funeral Home in Reedsburg with Pastor David Glesne officiating. Interment will be in Greenwood Cemetery. In lieu of flowers, memorials to St. Joseph’s Hospital in Hillsboro would be appreciated. The Hoof Funeral Home is serving the family. Name Variation Donald Meyer was also known as Don. Donald Meyer was born on 20 April 1929 at Wisconsin. Donald Meyer married Dolores L. Meyer, daughter of Paul Meyer and Elsa M. Hasz, on 1 October 1949. Donald Meyer died on 21 March 1997 at age 67. Donald Meyer graduated in 1948 at Reedsburg High School, Reedsburg, Sauk, Wisconsin. Fred Peters was born in October 1853 at Germany. He was the son of Fred Peters Sr. and unknown (?). Fred Peters married Pauline (?) circa 1880. Fred Peters died after 1900. Name Variation Pauline (?) was also known as Paulina (?). Married Name circa 1880 As of circa 1880,her married name was Peters. Pauline (?) was born in April 1863 at Germany. She married Fred Peters, son of Fred Peters Sr. and unknown (? ), circa 1880. Pauline (?) died after 1900. Pauline (?) had 7 with 5 living in 1900 children. Della Peters was born in January 1885 at Wisconsin. William Peters was born in October 1887 at Wisconsin. He was the son of Fred Peters and Pauline (?). Albert Peters was born in August 1890 at Wisconsin. Fred Peters Sr. married unknown (?). Fred Peters Sr. was born in August 1823 at Germany. Name Variation Pauline Peters was also known as Paulina. Pauline Peters was born in November 1898 at Wisconsin. Unknown (?) married Fred Peters Sr.
Child of unknown (?) and Fred Peters Sr.
Married Name circa 1892 As of circa 1892,her married name was Collis. Married Name circa 1892 As of circa 1892,her married name was Collies. Thrary (?) was born in October 1872 at Germany. She married Frederick Collis, son of August Ferdinand Collies and Pauline Reiker, circa 1892. Thrary (?) had 3 with 3 living in 1900 children. Name Variation Fred Collis was also known as Collies. Fred Collis was born in August 1893 at Wisconsin. He was the son of Frederick Collis and Thrary (?). Name Variation Elmer Collis was also known as Collies. Elmer Collis was born in October 1895 at Wisconsin. Name Variation August Collis was also known as Collies. August Collis was born in December 1897 at Wisconsin. Married Name 10 May 1894 As of 10 May 1894,her married name was Collies. Bertha Wilhelmina Henrietta Viebranz was born on 26 September 1869 at Germany. She was the daughter of Carl Viebranz and Albertine Zibell. Bertha Wilhelmina Henrietta Viebranz married John M. Collies, son of August Ferdinand Collies and Pauline Reiker, on 10 May 1894. Bertha Wilhelmina Henrietta Viebranz died on 21 November 1938 at age 69. Bertha Wilhelmina Henrietta Viebranz had 3 with 3 living in 1910 children. [S246] U.S. Federal Census 1880 U.S. Federal Census, by Ancestry.com, Dwelling 149. Matie Collies was born circa 1893 at Wisconsin. She was the daughter of John M. Collies and unknown (?). Married Name before 1893 As of before 1893,her married name was Collies. Unknown (?) married John M. Collies, son of August Ferdinand Collies and Pauline Reiker, before 1893. Unknown (?) died before 1895. Name Variation Edward Collies was also known as Eddie. Edward Collies was born on 17 April 1895 at Wisconsin. He was the son of John M. Collies and Bertha Wilhelmina Henrietta Viebranz. Edward Collies married Emma Hasse, daughter of (?) Hasse and Bertha (? ), on 28 October 1925. Edward Collies died on 16 February 1965 at age 69. Arthur Collies was born on 28 December 1896 at Wisconsin. Arthur Collies married Susana Bohn on 6 April 1918. Arthur Collies died on 5 July 1968 at age 71. Married Name 17 December 1924 As of 17 December 1924,her married name was Hasse. Amanda Matilda Collies was born on 19 December 1901 at Wisconsin. She was the daughter of John M. Collies and Bertha Wilhelmina Henrietta Viebranz. Amanda Matilda Collies married Walter Wilhelm Christian Hasse, son of (?) Hasse and Bertha (? ), on 17 December 1924. Amanda Matilda Collies died on 7 April 1979 at age 77. Married Name 28 October 1925 As of 28 October 1925,her married name was Collies. Emma Hasse was born on 18 July 1901. She was the daughter of (?) Hasse and Bertha (?). Emma Hasse married Edward Collies, son of John M. Collies and Bertha Wilhelmina Henrietta Viebranz, on 28 October 1925. Emma Hasse died on 1 October 1962 at age 61. Name Variation Raymond G. Westedt was also known as Raymond H. Westedt. Raymond G. Westedt married Agena Aurelia Emilie Schuette, daughter of Heinrich Johann Schuette and Augusta Bergwardt. Raymond G. Westedt was born on 30 April 1909 at Sauk, Wisconsin. 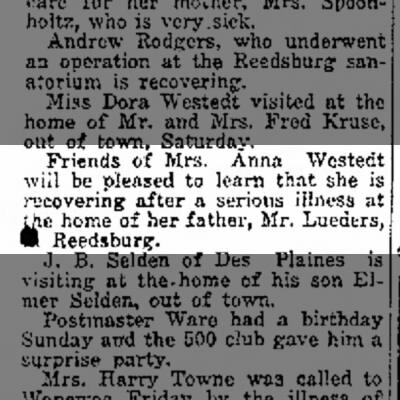 He was the son of Dr. Otto E. Westedt and Anna A. Lueders. Raymond G. Westedt died on 1 June 1980 at Wisconsin at age 71. Name Variation Frederick Lueders was also known as Luders. Name Variation Frederick Lueders was also known as Fred. Frederick Lueders was born in July 1853 at Hanover, Germany. He was the son of Jurgen Lueders and Maria Oetke. Frederick Lueders married Caroline Uphoff, daughter of Charles Uphoff Sr. and Charlotte (? ), circa 1880. Frederick Lueders died on 30 June 1935 at age 81. 1910 Reedsburg, Sauk, Wisconsin He was listed as the head of a family on the 1910 Census at Reedsburg, Sauk, Wisconsin. 25 April 1930 Reedsburg, Sauk, Wisconsin He was listed as father in Albert Fred Lueders's household on the 1930 Census at Reedsburg, Sauk, Wisconsin. Frederick Lueders immigrated in 1868. 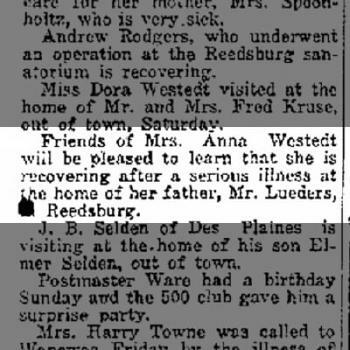 On 10 March 1922 Friends of Mrs Anna Westedt will be pleased to learn that she is recovering after a serious illness at the home of her father, Mr. Lueders, at Reedsburg. [S246] U.S. Federal Census 1880 U.S. Federal Census, by Ancestry.com, NA Film Number T9-1446 Page Number 208C. [S243] U.S. Federal Census 1920 U.S. Federal Census, by Ancestry.com, Year: 1920;Census Place: Reedburg Ward 2, Sauk, Wisconsin; Roll: T625_2015; Page: 8B; Enumeration District: 175; Image: 374. Name Variation Caroline Uphoff was also known as Uppoff. Name Variation Caroline Uphoff was also known as Carolina. Married Name circa 1880 As of circa 1880,her married name was Lueders. Married Name circa 1880 As of circa 1880,her married name was Luders. Caroline Uphoff was born in January 1864 at Wisconsin also reported as 1863. Caroline Uphoff married Frederick Lueders, son of Jurgen Lueders and Maria Oetke, circa 1880. Caroline Uphoff died on 6 May 1921 at age 57. 1910 Reedsburg, Sauk, Wisconsin Caroline Uphoff was listed as wife in Frederick Lueders's household on the 1910 Census at Reedsburg, Sauk, Wisconsin. Caroline Uphoff had 5 with 5 living in 1900 children. She had 5 with 5 living in 1910 children. Married Name before 1911 As of before 1911,her married name was Schroeder. Bertha Lueders was born in March 1881 at Wisconsin. Bertha Lueders married George Schroeder before 1911. Bertha Lueders died before August 1976. Albert Fred Lueders was born on 10 December 1885 at Wisconsin. He was the son of Frederick Lueders and Caroline Uphoff. Albert Fred Lueders married Rose M. Springbrunn, daughter of John Springbrunn, circa 1910. Albert Fred Lueders died on 23 October 1956 at age 70. 1910 Reedsburg, Sauk, Wisconsin Albert Fred Lueders was listed as a son in Frederick Lueders's household on the 1910 Census at Reedsburg, Sauk, Wisconsin. 25 April 1930 Reedsburg, Sauk, Wisconsin Albert Fred Lueders was listed as the head of a family on the 1930 Census at Reedsburg, Sauk, Wisconsin. On 12 September 1918 at World War I Draft Registration, Sauk, Wisconsin. On 21 June 1922 at visit to Charles City, Iowa, Fred Lueders and two daughters, Miss Selma and Mrs. Anna Westedt, and her two children and Albert Lueders and family left Wednesday for Charles City, Ia., to visit a couple of weeks with the former's daughter, Mrs. George Schroeder. 24 June 1922 The Capital Times (Madison, WI). Edwin W. Lueders was born on 15 January 1890 at Wisconsin. Edwin W. Lueders married Edna C. (?) before 1917. Edwin W. Lueders died in July 1974 at age 84. Edwin W. Lueders obtained US Social Security Card at Wisconsin; last residence Milwaukee, Milwaukee, Wisconsin. He was a machinist at machine shop in 1910 at Milwaukee, Milwaukee, Wisconsin. On 5 June 1917 at World War I Draft Registration, Milwaukee, Wisconsin, Occupation: Machine Tinman at Sterling Motor Truck Co.
Married Name circa 1927 As of circa 1927,her married name was Schinnerer. Selma Charlotte Lueders was born on 8 November 1895 at Wisconsin also reported as Nov 1896. Selma Charlotte Lueders married Walter G. Schinnerer circa 1927. Selma Charlotte Lueders died on 8 June 1992 at Los Angeles, California, at age 96. 1910 Reedsburg, Sauk, Wisconsin Selma Charlotte Lueders was listed as a daughter in Frederick Lueders's household on the 1910 Census at Reedsburg, Sauk, Wisconsin. Selma Charlotte Lueders obtained US Social Security Card at California; last residence Boise, Ada, Idaho. 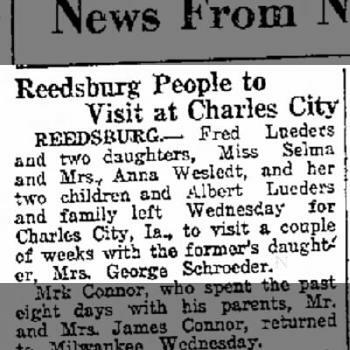 On 21 June 1922 at visit to Charles City, Iowa, Fred Lueders and two daughters, Miss Selma and Mrs. Anna Westedt, and her two children and Albert Lueders and family left Wednesday for Charles City, Ia., to visit a couple of weeks with the former's daughter, Mrs. George Schroeder. 24 June 1922 The Capital Times (Madison, WI). [S250] U.S. Federal Census 1930 U.S. Federal Census, by Ancestry.com, ED544. Dwelling 464. Married Name circa 1910 As of circa 1910,her married name was Lueders. Rose M. Springbrunn was born on 30 April 1885 at Wisconsin. She was the daughter of John Springbrunn. Rose M. Springbrunn married Albert Fred Lueders, son of Frederick Lueders and Caroline Uphoff, circa 1910. Rose M. Springbrunn died on 3 March 1936 at age 50. 1910 Reedsburg, Sauk, Wisconsin Rose M. Springbrunn was listed as a daughter-in-law in Frederick Lueders's household on the 1910 Census at Reedsburg, Sauk, Wisconsin. 25 April 1930 Reedsburg, Sauk, Wisconsin Rose M. Springbrunn was listed as wife in Albert Fred Lueders's household on the 1930 Census at Reedsburg, Sauk, Wisconsin.